Lens Description: The Samsung 85mm f/1.4 ED SSA Lens is a portrait-length lens specifically designed for Samsung\'s line of NX mirrorless cameras. 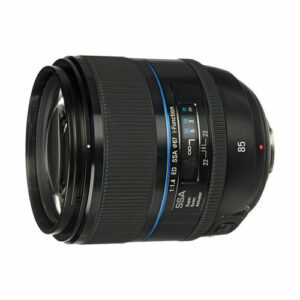 This 85mm lens has a 35mm equivalent focal length of 130.9mm and an ultra-fast maximum aperture of f/1.4. This long-length lens and wide aperture give you substantial room to control depth of field and truly separate your subjects from cluttered backgrounds. A Supersonic Actuator (SSA) provides quick and near-silent auto focusing, ideal for video use or when working in quiet environments.